Brazil is committed to help Africa build a future of stability and development, President Luiz Inacio Lula da Silva has said. On his last African tour as president, he said Brazil could never repay its historic debt to the continent. Brazilian trade with Africa has quadrupled since Lula became president in 2002. The Brazilian leader has made improving links with Africa a vital part of his foreign policy, which emphasises "South-South" relations. He has toured the continent at least ten times, visiting 25 different countries. Despite high popularity ratings at home, he is barred by the Brazilian constitution from a third consecutive term as president and must step down after elections in October. "Today we are united for the future," President Lula told a summit of the West African regional grouping Ecowas in Santa Maria, Cape Verde. "Brazil - not just me - took a political decision to make a re-encounter with the African continent." He said Brazil could never repay its "historic debt" to Africa - a reference to the millions of Brazilians who are descended from African slaves. "Brazil would not be what it is today without the participation of millions of Africans who helped build our country." He said Brazil was determined to help eliminate hunger and poverty in Africa through trade, investment and the transfer of technology. "Whoever comes after me has the moral, political and ethical obligation to do much more." President Pedro Pires of Cape Verde paid homage to Lula on behalf of Ecowas. "Brazil is a country that is respected and listened to, and its president is a great defender of Africa's interests. It should have a permanent seat on the UN Security Council," he said. 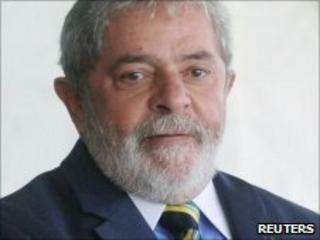 Trade between Brazil and Africa has grown from $6bn (£4bn) to $24bn (£16bn) under President Lula. Brazilian companies have invested heavily in oil and mining, and have taken on big infrastructure projects. Lula has also promoted cooperation on agricultural development and bio fuels, and launched an international television station - TV Brasil Internacional - that broadcasts to African nations. Lula's final tour also takes in Equatorial Guinea, Kenya, Tanzania, Zambia and South Africa. He will attend the Fifa World Cup final as leader of the host country for the 2014 tournament. He said he hoped Brazil would face an African team in the final in 2014.